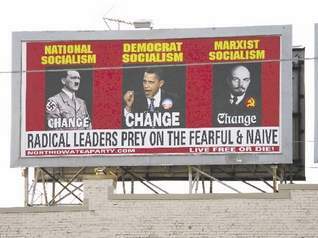 The message of a controversial billboard in Mason City comparing President Barack Obama to Adolf Hitler and Vladimir Lenin probably got lost in its visuals, a co-founder of the tea party group that paid for the sign said Tuesday. He said the underlying message remained: The country is headed in the wrong direction. The really funny thing (and this is about the whole Tea Party movement) they are completely unaware of irony (and history, but that’s another post). “Radical leaders who prey on the fearful and naive”? That’s about as accurate a description of the Tea Party I’ve heard yet. When one side is leading through hope and change, and the other is trying to tear down by focusing on fear and death, it’s a pretty easy call IMHO, as to which to support. Speaking of the fearful and naive…. Mark Tlusty, a member of the group and a district chairman of the Floyd County Republican Party, defended the billboard earlier this year while also discussing his fears about health care reform. “Why would I want someone to take one-sixth of the economy over and just ram it down so many people if they don’t want it to begin with?” Tlusty asked. This is the sad thing about the TP and HCR, they keep calling it what it isn’t (a government takeover) and then multiply that fear and naivete to unheard of levels. The punchline is, well, stuff like the sign above. Which would be, to be honest, funny if they meant it as parody, but they don’t, which makes it sad. How long till the Boomers are gone again? ← I like the part at the end, where they just roar at one another.